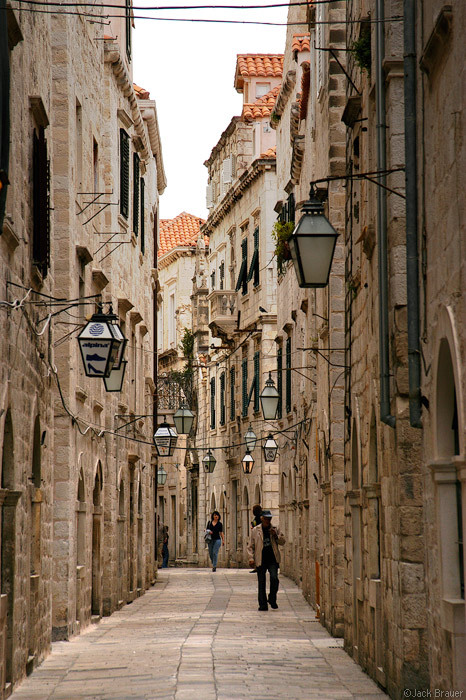 The narrow and winding streets of medieval cities are a huge part of European Romanticism. In contrast, Seattle, like almost all American cities, has relatively wide street right-of-ways. Usually this is simply taken as a fact and we do what we can to mitigate it: vegetated medians, mid-block crossings, curb bulbs, etc. But what if we actually tried to narrow our streets? What if we strategically chose areas to create smaller, more pedestrian friendly pathways? Baron Haussmann secured his place in the urbanist liturgy when he “opened up” Paris by destroying dozens of buildings and replacing them with a network of wide boulevards. Who’s to say we can’t do just the opposite and concentrate the energy of some of our neighborhoods? Risking accusations of “Eurocentric nostalgia” I’d like to flesh out the concept of street narrowing and its implementation in a city like Seattle. Certainly the first question to ask is, are narrow streets really a good thing? They have their drawbacks (light exposure, vehicle capacity) but they can also bring some nice benefits. 1.) Human Scale. There is an unbelievable feeling of ease when one wanders the Latin Quarter in Paris or the maze of streets around the Pantheon in Rome. By their very nature, narrow streets are scaled to the human rather than the machine. In fact rather than entities unto themselves, small streets are simply the absence of buildings; they foster a much more cohesive sense of place by removing the vast swaths of dead space that surround the typical American city block. This point is punctuated by the aerial comparison below. Paris (left) is a spread of buildings, with roads interspersed. Seattle (right) is a spread of asphalt with buildings interspersed. 2.) Density. The above comparison also highlights the shear increase in building space that narrow streets afford. In some instances narrowing streets may be a useful alternative to raising heights, a politically hot topic in many of our communities. The Old Urbanist estimates that shrinking streets by 10 feet can increase the buildable area by almost 9%. 3.) Cost Efficiency. In these tough economic times, one cannot overlook the financial benefits that narrow streets provide a municipality. Current streets are essentially a liability; a study in Sacramento put the cost of road maintenance at over $60,000 per mile per year. Narrow streets can help minimize these costs. Further, since this land is transferred to the private sector, it increases the assessed land value in the city. As Roger Valdez has so thoroughly explained this may not directly increase tax revenues but at the very least it can lower the property tax burden on individuals and perhaps increase sales tax revenue. In the model, the benefits are substantial. But of course a comprehensive approach to street narrowing comes with many other challenges. First of all, an actual street narrowing would require much more than a single block. It would need to be a coordinated effort along an entire ROW. Even on a single block there would likely be multiple property owners instead of just one. It should also be said that road diets in this city are probably just as contentious as height limits so political feasibility may not be very high. That said, I think it could be done in some targeted areas. We could begin with a plan that identifies streets with minimal traffic, a high chance of significant redevelopment, and a sympathetic community. Once a street is identified a new property line would be drawn with easement requirements to address any public concerns. Taking advantage of the new TIF/TDR bill cities could front the money to push the sidewalk out and get paid back as development takes place over time. In the interim, property owners would be encouraged to take advantage of their new property with garden space, outdoor seating, or even a one story commercial addition in front, much like some of the old houses around Capitol Hill. Off the top of my head, I would think that 15th or 19th on Capitol Hill could be good commercial candidates, as neither connects any major destinations. Residential streets in the area could also work, providing some much needed traffic calming and adding space for DADU’s. Where else might be a good place for a street narrowing? Or is street narrowing even a good idea? I’d love to hear others’ thoughts on the concept and any challenges or opportunities I may have missed. Great article. I always thought we were stuck with wide streets – I didn’t think about narrowing them. Some of Seattle’s older neighborhoods have nice small streets. Sure, they’re generally single family areas, but the streets are small enough to only let one car through at a time. My neighborhood is this way and it’s great – traffic noise is non-existant and I never feel unsafe crossing the street (or even walking in it!). One blank slate we’re about to get is the waterfront. Rather than having a massive highway-like street on the surface, right over the world’s largest bore tunnel, it would be great to reclaim this space for pedestrians. Build tiny streets with lots of Y’s and require storefronts throughout with a maximum 20′ width. Allow Paris-level heights to not block too views, and break the land into small parcels. The horse is already out of the barn, but SLU would have been an awesome spot to experiment with. 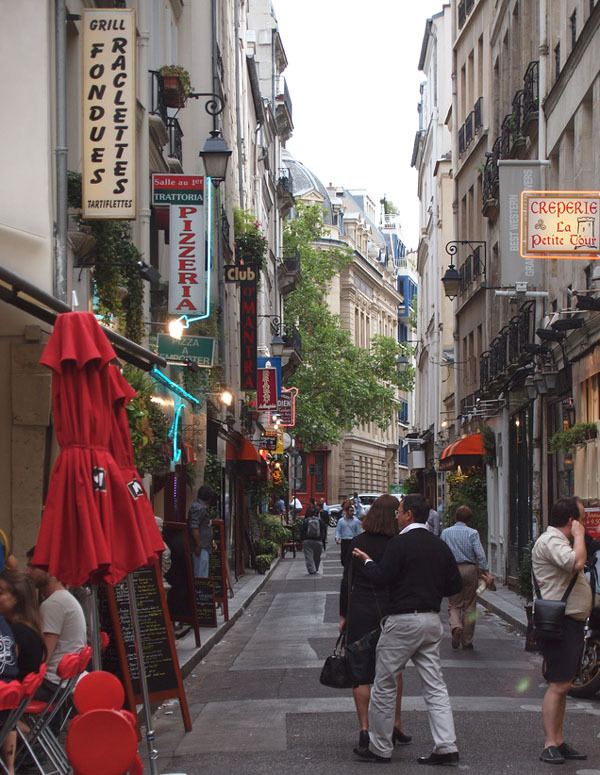 Excellent examples of what I call Really Narrow Streets, which are really pedestrian streets. It is very common throughout the world. However, I generally don’t think it is a good idea to start with the notion of “narrowing” existing streets. At first, it would be best to reconstruct a small part of the city, which may have previously held an old factory, waterfront or something of the sort. It would also be possible to build from a green field, or a nearly-open space such as a parking lot near an existing train station, or something of that sort. “parking lot near an existing train station” Like this? (please excuse the quick sketch by a non-architect) Of course what’s actually going there isn’t exactly what I had in mind (“superblock site” sounds daunting), but at least it’s better than a parking lot. Yeah, I had the scale wrong. In my mind the perfect street can let a small car drive down with a few feet to spare on each side and that’s it. This allows for night deliveries to shops and ferrying the elderly with luggage to their hotels. I love Venice. Too bad it’s sinking. There are hundreds of small cities designed like this in and around Italy. Dubrovnik is a good example. A typical lane for automobile traffic is about eight feet wide. Most pedestrian streets are wider than that, so access by taxis or delivery vehicles is generally not a problem. The main thing to keep in mind, in my opinion, is that the street should be one single unit for pedestrian use. What this means in effect is: NO SIDEWALKS. A sidewalk is a division of the street into a pedestrian-specific part and an auto-specific part. Well, now you have part of the street dedicated to automobiles, which is counter to our first proposition of a place that is dedicated to people. 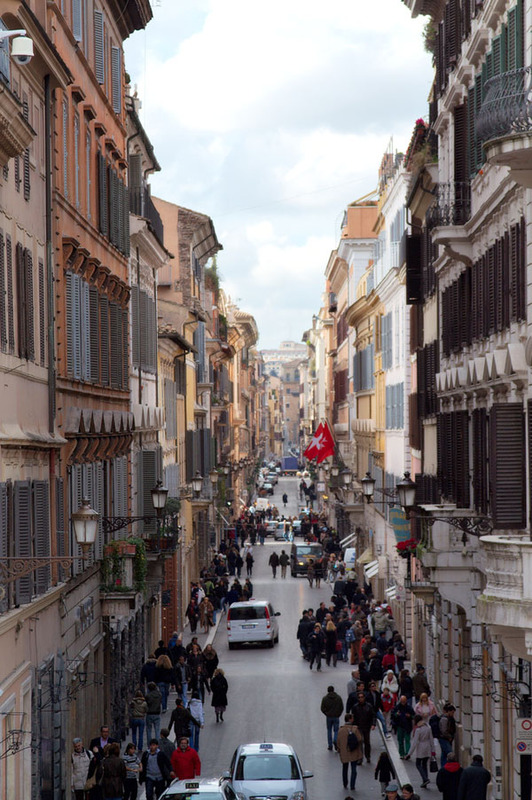 Sometimes even rather narrow streets (let’s say 12-15 feet) are divided into a roadway and sidewalks, which causes problems even though the street width is quite narrow. You see this in Paris quite often. I would guess the sidewalk/roadway division was done sometime during the 20th century, as a “modernization.” As you can immediately perceive, the right-of-way is no longer a pedestrian-centric space, it is an automobile roadway with a little catwalk on the side where people can cower. Also note that what would be a quite spacious pedestrian street now feels very “congested” due to all the cars parked here and the rather narrow lane for driving. In short, it went from a great place for walking to a place that is not good for either driving or walking. I remember a town in Thailand that had a very small 1-way street squeezed between buildings and a sidewalk that was more like a curb (~15″ wide). All of the pedestrians were walking on this “sidewalk”, waiting for a break in the cars to hop in the street to pass pedestrians going the other way. Of course this is all psychological – just remove the sidewalk and people would share the road with the cars. I honestly hadn’t realized that until just now – at the time I just squeezed on the tiny sidewalk with everyone else. A wasted opportunity – to reclaim the site of NYC’s WorldTradeCenter and make it an UrbanVillage neighborhood, instead of putting up more stupid skyscrapers and memorials. I think that much of the beauty of the shot is in craftsmanship, design details and materials, and not just the street width. I like the concept, but can you imagine want that same view would look like using modern building materials? that’s like 65′ straight up of fiber cement and metal siding. I can easily imagine block after block of the offspring of Escala and McDonald’s, since there’s no reason to think this scheme would develop any differently than the average. The craftsmanship in the photo is very nice, but the most important thing is that the street is a place for humans, without two to six lanes of auto traffic in the middle, and is sized appropriately, 10-25 feet wide from building to building. You can use modern materials and also get a wonderful result. You know what could be a more economic option for bringing this type of human scale into Seattle (and many other American grid-irons for that matter)? 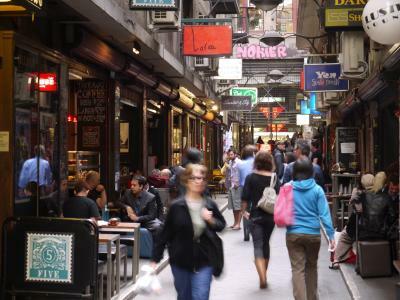 The evolution of our alleyway network into a new breed of urban scale and culture. I thought I might share my research on this vary topic with you here at http://www.alleysofseattle.com. There will be an event exhibiting all kinds of human scaled alley urbanism from around the U.S., Australia, and Japan on May 11 in Belltown. See the site for details. I agree, we need this scale in our lives and cities. Like in Melbourne? They revitalized their urban core by activating the backalleys, not just using them for waste containers. Not sure this is more economical (it would require public resources without any increased revenues) but it is certainly a lot more politically feasible at this point. Seattle is lucky to have the alleys that we do and I definitely think they are underutilized. Your work on this idea is impressive, thank you! Josh — I really enjoyed this post. The numbers you’ve put together showing the amount of space added and value gained are striking (much more to the point than the ones I put up) and I think would turn some heads in city government. At the very least it’s a way of thinking about all the value the city is just sitting on in its downtown area — given that in most American downtowns as much as 40-50% of the land area is given over to right-of-ways. Why should the arbitrary planning decisions of 19th century land speculators continue to dictate this pattern of use? There’s nothing sacred in the dimensions they chose, nor was there much forethought behind them. Nathan may be right that narrow streets would be easier to implement on a greenfield or brownfield, but there’s no harm done in optimistic thinking. The funny thing to me is that the city already basically gives away public right of way via alley vacations for full-block projects, usually with some vague promise of a “public” courtyard. There are several alley vacations in that aerial shot of South Lake Union; the Amazon ones are fairly good, the one for Mirabella is an absolute disaster. Seems like several other spots would be great places for street narrowing: the super-wide part of Dexter Ave N, dead-end streets like 8th Ave N or John St, and places where the grid shifts. The tricky part would probably be any existing utilities, and of course the political controversy. Another tricky part would be the transition. You’d perhaps start with moving sidewalks inward, then a building will build up to it, then 5 years later another building would build up to it, then a decade later 2 more, etc. Your street wall might not be complete for a century. JDF, really good comparison with the alley vacations. This kind of public land transfer is already happening but unfortunately not nearly as strategically as it could be. You can use Photoshop like this designer to make good cases for narrowing streets! Seattle has some very narrow sidewalks that are often cluttered with “street furniture” to the point where it is difficult to pass other pedestrians. How about widening the sidewalks and leaving some of the sky, sun, and air in place? Ownership of our streets has been ceded to cars and their needs for lanes and parking. I don’t think we should give away real estate and create warrens in order to reclaim ownership of the public areas for people. Lets keep the sky open so the sun can shine in. In short, when it comes to making a street a quality pedestrian environment, the difference between 50 and 60 feet is actually more profound than the difference between 20 and 30 or 40 and 50. This is because at over 50 feet (curb to curb) the human ability to engage visually with people and objects on the other side falls off dramatically. Thus in Seattle I would prioritize neighborhoods with wide streets (such as Downtown) for road narrowing. I love this idea. It certainly would present a multiplicity of technical and political challenges, but it is inspiring to imagine that we might not be 100% stuck with the rushed and un-imaginative “grid-think” decisions of our esteemed forbears. Since I read this post I’ve been down many Seattle streets and can’t help imagining this. I think it would work great in any of the neighborhoods and in areas surrounding downtown. But in downtown itself we really could build buildings where there are currently streets. This would create sharp street walls at least on one side, and there’s enough room between sidewalks for a reasonable size building. Of course this would face strong opposition if widely done, but I could imagine closing down a street or two for this (Pike? Bell?). Usually, when people consider ways of converting existing 19th Century Hypertrophic design and layout (central Seattle, where I lived for a while), they eventually conclude that the sensible thing would be to take the central roadway and put buildings on it, and use the sidewalks on either side as the new streets. This would be quite a leap for most people, but it is worth experimenting with somewhere. For example, if you wanted to do an “urban revitalization” project in some run-down neighborhood, you might take a small area, just a few blocks, and build up the central roadways in this manner. I would suggest this for some run-down Bronx or Queens neighborhood that has good access to the existing subway system. However, this is mostly a kludge. It would be best to start with what amounts to a blank sheet of paper, where you could use Traditional City design from first principles. 1) Here in Israel – and the rest of the middle east – pedestrian areas are often colonnades under overhanging buildings. 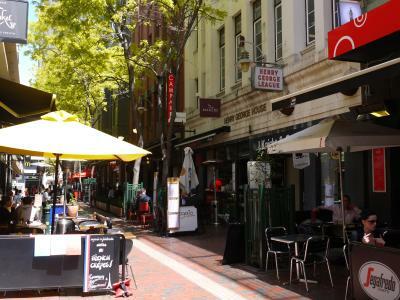 This produces a shaded souk/market/cafe area in hot, sunny climates. In this case the columns themselves protect pedestrians, and small streets need no raised sidewalk. 2) There is still a lot of crazy driving/parking in the narrow old city lanes of a place like Jerusalem. I think the people promoting small streets have a secret, romantic hope that this will drive more cars out of urban areas. That is NOT happening in developing areas. The car is here to stay, increasing in numbers (if decreasing in size) and must be accommodated. The most successful modern deployment of narrow streets here in Jerusalem and Tel-Aviv was the wholesale conversion of some areas into no-car pedestrian zones – effectively creating open-air malls in entertainment districts. In contrast, wherever cars and pedestrians mix, it’s a nightmare for both – not at all matching the romantic predictions implied by this article and accompanying photos. Great article. One other major component to consider is the transportation / mobility component to support the case for more narrow / livable streets. As you increase the attractiveness of streets to pedestrians and cyclists AND increase urban densities (as you had stated in your article), you will slowly move toward higher proportions of people getting out of their vehicles. Secondly, there are many streets that are destinations. You indicated that there are places where the narrow streets essentially act as “gaps” between buildings. There are many places in North American cities which are destinations that also have wide streets / right-of-ways where there is opportunity to convert to move pedestrian friendly streets. There is so much already happening in this regard and it looks like it will continue – check out http://www.streetfilms.org if you haven’t already. Who and where to order this summer on holiday, share your information. Aren’t 15th E and 19th E essential fire truck routes? Isn’t difficult fire truck access a problem in general for this proposal? What’s the experience of fire response for buildings on such streets in other cities? In a region with subduction earthquakes, how do streets narrow enough to be completely blocked with rubble from buildings complicate matters? Or do you assume most or all buildings will be able to withstand a magnitude 9 quake? With climate change and peak oil in mind, perhaps it would be better to reserve wide streets for eventual re-purposing for agriculture. Obviously replying to an old post here, but I need to laugh at Dan Cortland in his second post. The wide streets will make peak oil and climate change happen sooner! Normal people don’t cross seriously wide streets unless they seriously have no choice; you might as well have put a continuous wall in the median.